Free Shipping to Continental USA! Vexlar's FL-12 has a sun shade-free face that is something to behold. Its streamlined, flat surface won't trap moisture and increases viewing angle by more than 50%, so you won't have to turn the unit toward you to read the bright color display. The super-bright LEDs make a sun shield unnecessary. Capable of measuring depth to 200 ft., the FL-12 also has enhanced immunity to noise. Two control knobs operate the system, and there is a 10-step interference rejection feature. A new 20-ft. Low Power Range Mode picks out fish in the shallows, even in weeds. The Ultra Pack includes an enclosed 12-volt, 9-amp battery compartment, master on/off power switch, a battery status indicator, protected external charging ports, universal transducer holder, "dead stick" rod holder, an Ice-Ducer® transducer and a tackle box. Factory assembled and tested, instructional DVD included. The Pro Pack II has an enlarged, strong handle that also supports the gimbal bracket, making it easier to tilt up for vertical viewing. 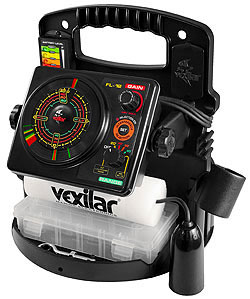 Comes with a battery status indicator, a rod holder, tackle box, and an Ice-Ducer® transducer. Secure, easy access to battery terminals. 12-volt, 9-amp-hour battery and charger included. Instructional DVD included. Convert your Vexilar winter pack into your boat for summer fishing with the conversion kit. The kit comes with a transducer, power cord, gimbal bracket and hardware. Or, upgrade or replace your Ice-ducer transducer. To order the Vexilar Fl-12, add to cart. SOLD OUT! Do not order. VEXILAR FL-12 PRO PACK II w/12 deg. ducer 64946 SOLD OUT! Email jollyannmarine@gmail.com with questions. Free shipping to the continental USA!